The concept of multiple baselines seems almost contrary to the definition of a baseline. After all, the purpose of a baseline is to set the proverbial stake in the sand and measure progress against it. You might keep multiple baselines in Project 2013 for several purposes. You have a baseline plan for a customer and another one for the internal team. In other words, you might want to steer the team to a tighter deadline than the promised delivery date. You have multiple scenarios for the project. Maybe you’re unsure whether you’ll need an extra widget for the gadget you’re building. You can set one baseline that assumes the extra widget is unnecessary and set another baseline that assumes it’s vital. You’re anticipating a risk event taking place. You want to develop a recovery plan or response plan in one baseline version of the plan. You’re analyzing the effect of a change to the project schedule (or another element of the project plan) that affects the project or product scope. You can set a different baseline to see the before-and-after effect of the change, though in this case you may prefer to reset the baseline. 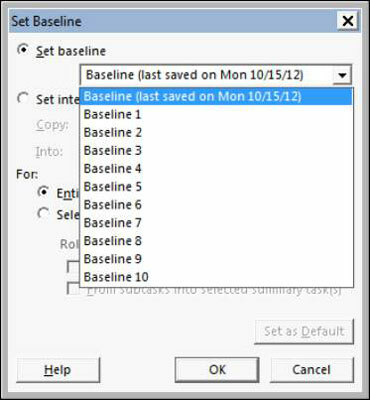 The Set Baseline dialog box includes a list of these baselines, with a date stamp of the last date each was saved. When you save a baseline, you can save without overwriting an existing baseline by simply selecting another one of the baselines in this list before saving. If you save multiple baselines or interim plans, you can view them by displaying columns in any sheet view for those plans. For example, if you want to display information for a baseline you saved with the name Baseline 7, you would insert the column named Baseline 7 into the Gantt Chart view sheet. You can view multiple baselines at one time by displaying Multiple Baselines Gantt view. When calculating variances (whether the schedule is early or late or costs are over or under budget), Project uses only the first baseline that’s saved (the one named Baseline, not Baseline1). If the project schedule and other parameters change dramatically, such as when a project is delayed and later revived, you produce more valid variance data by clearing and resetting the baseline. The more baselines you save, the larger the Project file becomes and the more it can slow performance.